As you're probably aware, Easter is only round the bend... Ah, Easter - a time for eating stupidly large amounts of chocolate, a time for hanging out with family and friends while in before-mentioned cocoa coma (cocoma? ), and time for a lovely jubbly four day weekend. Or for those still in education, it spells the beginning of a two/sometimes four week break. Lucky sods. Don't have much planned this Easter? I have just the thing. This week marks the start of the 16th annual Leeds Young People's Film Festival, the "UK's largest family film adventure," which starts tomorrow and ends on Friday 10th April. This series of events is exclusively focused towards... (hmm, take a guess)... yup, young people! When I first heard about it, I figured it would pretty much only cater to children. A lot of the events are primarily for families and their kids, like the Sing and Dance along to Frozen (although I know quite a number of 20+ years old who are quite partial to a little Let It Goooooooooooo). BUT, there's also a nice selection of things for people, like myself, who are planted quite firmly in the adult world. What's nice about this festival is that it's really utilising the great venues in Leeds. Over Easter weekend the beautiful Leeds Town Hall (seen above) will be transformed, with support from British Film Institute and using public funding by the National Lottery through Arts Council England, into The Film House. Also housing features will be Hyde Park Picture House, which I've mentioned previously in a post, as well as a family-friendly programme of Pixar films at Trinity Centre's Everyman Cinema. Day passes for over 18s to the Film House will cost you £7.50, which is the price of your standard non-Orange-Wednesday cinema ticket, There's set to be a whole host of entertainment alongside the film showings, including food vendors, film characters, and impressive film props (one in particular I'll mention later). To celebrate the 30th anniversary of this much-loved film, the Leeds Young People's Film Festival, in partnership with the Leeds International Film Festival, will be holding a screening at Leeds Town Hall. 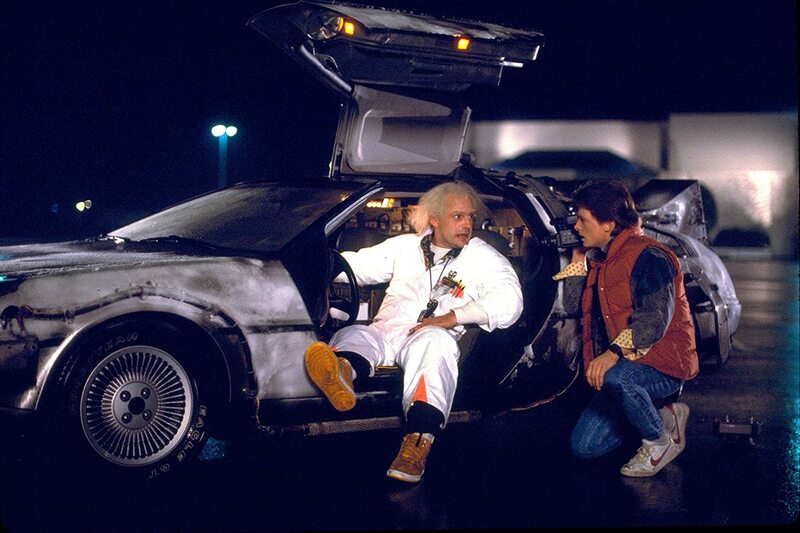 They've got a real-life Delorean car just to make it even better! I've never actually seen this film (whaaat - I know right) so I can't wait to witness it in this amazing environment. Other films on the evening schedule over the weekend include Blade Runner: the Final Cut, The Sound of Music (50th Anniversary screening), and Labyrinth - you know, the one with David Bowie as the Goblin King in tight TIGHT leggings. Hear me out! As a firm fan of Wallace and Gromit from childhood, this showing sounds great to me, especially as it's followed at 2pm by a masterclass with David Bunting, the animator on Shaun the Sheep, Chuggington, and Bob the Builder. You'll get to see exactly how Shaun the Sheep went from script to screen, and try out stop-animation for yourself. On the Not For Rental programme for viewers 15 and over at Hyde Park Picture House is Persepolis, based on director Marjane Satrapi's autobiographical graphic novel of the same name. This incredible animated film, set during the Iranian Revolution, is something you MUST see. I haven't watched it for many years, so my memory of the film is something that definitely needs refreshing. The Hyde Park Picture House is a beautiful cinema and a sight in itself, so combine the two by heading to this late afternoon showing. Marjane Satropi's new film The Voices, starring Ryan Reynolds, is also playing in the festival. This amazing documentary chronicles the making of Nas' seminal album, and arguably the best hip-hop debut of all time, Illmatic. Through old footage, we see Nasty Nas as he transitions from his bleak beginnings in the projects to the peak of stardom, before making the journey back to his roots and finding out some morbid truths about the fates of his Queensbridge peers. The film also maps the musical legacy of the album, along with the idea of generations, through its depiction of Nas' father - a famous jazz musician - and then Nas' own children. A must see for anyone interested in hip-hop and/or race relations in America. As explained in the festival programme: "Commissioned by the BBC to commemorate the 70th anniversary of the liberation of Auschwitz, Children of the Holocaust brings together Holocaust survivors’ eyewitness accounts with stunning animation, keeping these eternally important stories of survival alive through re-telling for a young audience. We will be welcoming series producer Kath Shackleton from Fettle Animation to the screening to talk about the creation of this remarkable film." This is such an important film, one that we - adults and children alike - all should see. So those were my five top picks for 2015's Leeds Young People's Film Festival! Other movies that stand out on the bill are German film About a Girl and Danish film When Animals Dream. For families, there will be a special preview of The Moomins on the Riviera, along with screenings of The Witches and Edward Scissorhands to mark their 25th anniversaries. Wow, doesn't that make you feel old! Other events include an Easter Egg Adventure in the basement of The Film House, where the kiddlywinks may even be lucky enough to meet the Easter Bunny. Tickets are only £4.50.